Not much done since last week. My newest (5 months now) angel has been getting up 3-4 times a night and I've been a zombie. She just started taking longer naps during the day. I even got to nap with her yesterday. :) There is no off switch for the ringer on my phone, but burying it under the sofa cushions with the volume turned down during naps has really helped. I've added bullion buds to the upper left seam, cast on circles to the lower left seam, more random filler to the texture build-up in the lower left, straight stitches between the bottom half buttonhole wheels with chain stitch vines along the top, and metallic straight stitches around the ribbon French knot clusters. The lace motifs are not stitched down yet, but I'm pretty sure about the larger two. The smaller oval one may still become a button cluster with beads. The lace motif under the silk ribbon motif really works for me. I have observed that my SRE florals tend to be rather geometric and look more like floral arrangements than the wonderfully organic natural looking florals I've seen others do. This isn't bad. I'd just like to be able to do both and will have to put more effort into designing a more natural looking arrangement. I blame it on the mathematically oriented side of my brain. Anyway, putting the lace under the motif makes the arrangement look right, like it has a structure of some sort to be sitting on. The bow may still find it's way onto that spot, but I haven't tried it with the lace yet. I'm quite happy with how the vines turned out. I picked out flower beads for the wheels, but it was still a visual stopping point that just bothered me. The vines have fixed that. I tried a knotted cretan vine, which is this week's TAST challenge, but it didn't work there. I thought about barred chain, but then forgot and did regular chains. I'm glad about that though With the other thorny vine in that area, I like the smooth flowing chains. Now to add little knots or beads or something. This is my class block so far. Not many of the laces and trims made the final cut. The motif I was thinking of for the lower right corner is still an option. The other motif has been changed to an idea for a curly button motif with trailing beads. I have an idea for a ribbon bow under the silk ribbon flowers. I've also seen it on Sharon's site also. It's a little twisted in spots, but that will get straightened out when I add beads. The green seam almost across the middle was the first one I did and I'm still waiting for inspiration to strike and tell me what to do with it now that it's there. The little pink seam that looks like V's is up and down buttonhole. That's a new stitch for me that I picked up from Take A Stitch Tuesday. I don't know if I'd use the straight form of it, but I like the angles. None of the seams are finished yet, but this is what I have so far. Gathering threads and fibers for each of the class blocks I've started. There are some packets of 2mm and 3mm sequins here to try, but I'll dig into the beads after I get some stitching done. Hi. My name is Kate and I am a fickle stitcher. Ok. So that may not warrant a 12 step program, but there it is. I work in batches and I jump around from one project to another. I'm okay with that. It irritates the heck out of my husband how many projects I have started, but hey, he loves me. As long as I am devoted to only him, he can live with how many projects I have on the side. While I was looking for trim for my first class block and thinking it just wasn't coming together for the encrusted look, these two stepped up. The pink block is ready for stitching. The lace and braids are sewn on. The tatting and pink flower lace are not sewn yet. The flower will likely be layered over stitching done to the gold braids. The lace on the blue block is not sewn down yet, but it is mostly set where it will go. The only thing I haven't decided on yet is the one seem on the bottom that may have the dark blue ribbon, the white motif, or both. Also, the dove has taken up temporary residence, but may move depending on what gets added around the angel print. The whitish looking fabric is not quite as high a contrast as it looks. It looks white in the pictures, but is actually a pale blue shimmery fabric. I can see this block stitched and trimmed with blues, aquas, white, and lots of yellow accents. I've been playing with different laces and trims for my class block. Nothing is sewn on yet. I can't decide which arrangement I like best or even whether to leave some of it off. After the first round of playing with trims, this block just didn't seem right for the encrusted look with what I had on hand. Then I started finding odd bits tucked here and there while I was looking for other odd bits. The doily is one of those odd bits. I made it with pearl cotton a while back to use as a coaster. The black lace I don't know about. The bottom left patch has all those black speckles and looks out of place, so I was trying the lace. My artist husband doesn't like it, but I think he sees it as it is. Whereas, I see it as a possible layer within the finished piece. I can see it toning down the polka dot feel I get from the black speckled fabric while also adding bits of black stitching and beads elsewhere on the block. Maybe also trading in the motif next to it for a cluster and trail of cream buttons and beads with a few wine bits tossed in. Or it may just get left out. It will probably get left out. I later found that narrow bit of wine trim that I like across the speckled fabric and it fits with the plan I came up with in my last post. The cream motif towards the middle could easily be swapped for a bead trailing button cluster. The sheer ribbon could work with my trailing silk ribbon floral or grape vine. Although I'm not sure if red grapes would contrast enough over the darker patches and they might look spoiled if they were too light. Florals are proabably better there. SRE over the doily would prabably be too dimensional to fit the rest of the block. The doily is crocheted with size 5 pearl cotton. I wonder if it would work layered over the eyelet piece instead of the tatting in the upper left. I didn't try that. So much to try and so little time. I'm taking a class with Sharon B. to work on my design concepts. This is a 9" block I pieced some time ago when I was new to crazy quilting and working on my piecing techniques. The area that jumps out at me is three red patches together. I've outlined them in blue. They read as a big dark chunk instead of individual patches. It bothers me that there are no angles across the top right corner. As a result the block looks lopsided. I plan to remedy this with a sweeping 'off the seam' treatment of meandering vines/florals where the green squiggles are. 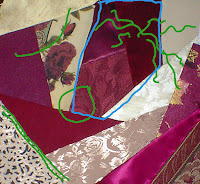 The double green line is a seam I may emphasize with a linear seam treatment to separate the cream patches. The upper left corner seems to need a curved something, maybe lace or a doily across the corner. The green circle looks like a good place for a motif. The bottom right corner has several angles that may get curvy flowing seam treatments along the lines. Most of this plan seems contradictory to the lesson suggestions. I'm not sure why it makes the block feel right. If there are dominant lines of directed tension, I'm missing them. Maybe that has to do with my piecing techniques or maybe it just feels right now and won't once the plan is put into action. Looking at it again, the seam along the shiny cream patch that intersects the double green line could be a dominant line. After rereading the lesson, the green circle looks like it should go slightly lower and to the left where the three shorter seams would intersect if they continued. Maybe I just don't get it, but then again, maybe I'm just gifted with the talent to work intuitively. I'm curious what others think. Any comments?